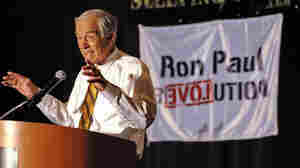 Ron Paul Explore the latest NPR coverage of GOP presidential candidate Ron Paul. 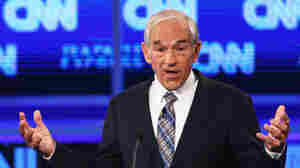 Explore the latest NPR coverage of GOP presidential candidate Ron Paul. September 30, 2011  The Republican presidential candidate said the action amounted to the assassination of an American citizen "without charges." "We should think very seriously about this," he said. September 14, 2011  A story getting much attention Wednesday is the tale carried by Gawker of Rep. Ron Paul's 2008 campaign manager who didn't have health insurance or much money when he died of pneumonia three years ago. Snyder's mother received a $400,000 hospital bill after her son's death. September 13, 2011  Paul's assertion was less controversial than the response from some in the crowd at the GOP debate who said they approved of the government letting the uninsured die. 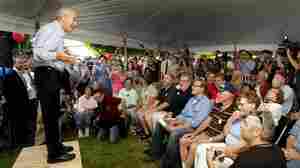 September 1, 2011  "Look in the eyes of Vermonters who've lost their homes, who've lost their businesses, who've seen their husbands and children killed by the storm and see the kind of response that FEMA is giving us," says Democrat Peter Shumlin. August 31, 2011  From financial crises to problems with the wars in Iraq and Afghanistan, Paul said, his warnings about a government that's too big and spending that's out of control have come true. August 29, 2011  "It's a system of bureaucratic central economic planning, which is a policy that is deeply flawed," the congressman and Republican presidential candidate says. August 19, 2011  During the last presidential race, the Texas congressman had some of the most fervent supporters in the Republican field, but that didn't translate to electoral success. 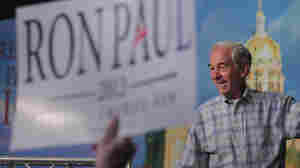 This year, Paul supporters are disappointed in the lack of coverage after he finished second in the Iowa straw poll. August 16, 2011  Even when the GOP congressman succeeds at a level other Republican presidential candidates haven't, he has been mostly ignored. Why aren't the media talking about his chances? 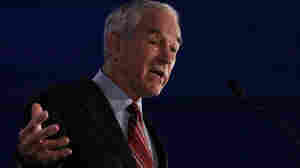 Ron Paul Campaign Ad Calls Him 'The One.' Sound Familiar? August 16, 2011  Fresh off his strong second place finish in Iowa's Ames Straw Poll, Ron Paul has a new campaign ad called "The One" in which he is portrayed as an entirely different type of leader than the"smooth-talking politicians" he's competing against for the presidency. 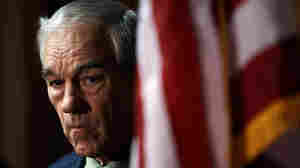 July 12, 2011  Rep. Ron Paul, one of the best-known U.S. House members, also one of the nation's most famous libertarians, let it be known Tuesday he won't run for re-election to focus on what is largely considered by many to be a quixotic run for the White House. May 16, 2011  The 75-year-old Texas congressman is a lonely voice in Congress: He rails against government spending, argues against wars and calls for the legalization of drugs. But Paul, who has run for president twice before, packs halls on college campuses. April 26, 2011  Rep. Ron Paul has long spoken his mind on issues even when he was the only one in his party with the position, like opposing the invasion of Iraq. His candor and willingness to be the lone politician holding a view has made him attractive to voters tired of cynical politicians who pander.